President Trump’s decision to walk out of the 2015 nuclear agreement with Tehran has prompted condemnation by other P5+1 members, including the EU, Russia and China. France’s National Front head Marine Le Pen believes that President Emmanuel Macron bears his share of responsibility” for the “illusions” he had about his ability to talk President Trump out of withdrawing from the nuclear deal with Tehran. “I resolutely condemn the position of Donald Trump and also that of the French diplomacy which, in its attempts to be even more neo-Conservative than (US national security adviser] John Bolton, has found itself without US patronage and no alternative way to go,” Le Pen said in a statement released on Friday. “France needs real world politics and rid itself of the neo-Conservative ideology, which has led to such destructive consequences [in the Middle and Near East] and finally to start defending the interests of France,” she emphasized. According to Le Pen, while defending the Iran nuclear deal, France should also resume genuine cooperation with Iran against Islamic terrorism with Russia and Syria to prevent new terrorist attacks on French soil. “Secondly, we should establish the post of a defense commissioner [in relations with Iran] and thirdly, we need to work out and implement a mechanism of bank payments that would help us resist the US diktat and protect bilateral exchanges [with Iran]," Le Pen added. Tehran could refuse to abide by the terms of the 2015 accord and resume its military nuclear program. 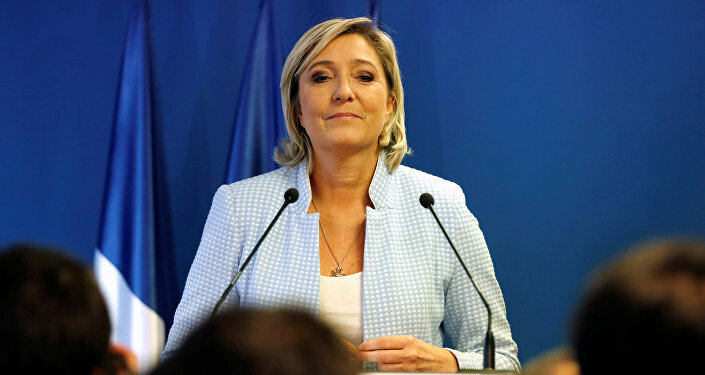 “Such diktat is impermissible and can’t be tolerated.” Le Pen emphasized. On May 8, President Donald Trump said that the United States was withdrawing from the Joint Comprehensive Plan of Action (JCPOA), which requires Tehran to maintain a peaceful nuclear program in exchange for sanctions relief. Trump promised to reinstate previous sanctions and add new ones. Simultaneously, he said that Washington was prepared to sign an amended nuclear deal with Tehran. The leaders of Britain, France and Germany have urged all the signatories to the JCPOA to stick to its provisions. Iranian President Hassan Rouhani has pledged to continue implementing the terms of the accord. Russia’s Foreign Minister Sergei Lavrov described the US withdrawal as a violation of a pertinent resolution by the UN Security Council and reiterated Moscow’s firm resolve to keep the JCPOA in place.